My love affair with Lovage started over 30 years ago when my Aunt Paula, a talented herbalist and educator, sent me flats of herbs to start my gardens in Bangor. I planted Lovage along the back fence in our yard, and it grew enormous, more than six feet in height, with towering, feathery blossoms. The stalks made great floral arrangements, and I fed kids the celery-tasting leaves. As a culinary herb, Lovage’s usage is similar to celery. The flavor of Levisticum officinale is more pronounced than celery, with a slight undertone of curry. For best results, try tasting it, and then taste and taste again. The leaves are delicious tossed in salad greens, particularly in the spring, when greens are scarce. 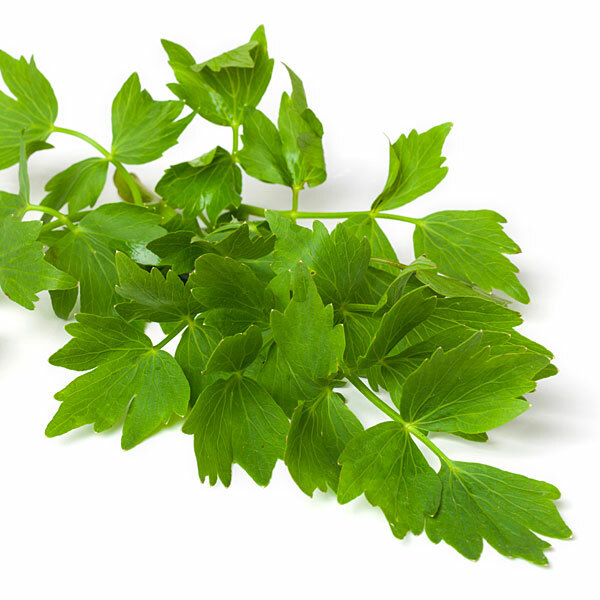 Lovage leaves finely chopped are delicious in chicken or fish salads, adding an exotic bite. Chopped lovage stems and leaves add a zip to soups. For winter use, mix equal parts of water and lovage leaves in the blender and freeze the puree in ice cube trays. When we moved down here to Stonington, Lovage was part of the “family” (which also included rhubarb, rabbits and horseradish) that came along for the ride. My love of Lovage faded for a bit, because Lovage didn’t like its first home. Planted in a bank of fill used to cover the water line, the plant dwindled every summer. No more tall stalks greeting me when I walked out the door, reminding me to enjoy the bounty of the earth. No more opulent blossoms with bees buzzing by. Last spring, I moved what remained of the almost-gone plant to its new home with deep and rich soil. I nurtured the location, adding seaweed, compost and rabbit manure. This spring, my passion for the plant has been rekindled. After a very dormant winter, full clumps of this perennial have burst forth. The stalks seem to grow by the hour, and the leaves beg me to taste them. A vase of Lovage sitting on the kitchen counter greets me every morning, and inspires me as I cook. Just recently at the Deer Isle Garden Club plant sale, an avid member was encouraging young families to take home and plant the Lovage plants. “Every home needs a Lovage,” she said. I totally agree. I love Lovage. Adapted from “Park’s Success with Herbs”, by Gertrude Foster and Rosemary Louden. Drain the tuna, place in medium bowl and flake with a fork. Add the cottage cheese, grated Horseradish, and chopped Lovage. Mix completely. Line 2 salad plates with mixed greens. Mound the salad over the top and sprinkle with chopped fresh herbs. Edible flowers (pansies, chive blossoms, nasturtium) would be pretty also. Nutritional analysis per serving: 213 calories, 39 grams protein, 7 grams carbohydrates, 5 grams fat, 759 mg. sodium, 2 grams fiber.